Having arrived home from our weekend in New Orleans at about 1AM this morning, it will likely take another day or two to fully recover. It was a fantastically fun weekend, full of amazing food and even better music, but three days at an all-day music festival, plus late jazz shows, decadent dinners, and lots and lots of walking mean we’ll need a few early nights and a week or so of light, healthy suppers to regain some balance. A trip over to Inman Oasis tonight for a hot tub soak is in order, as well. 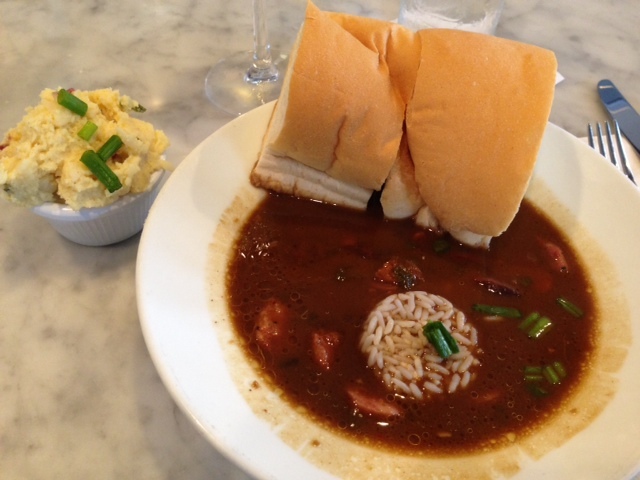 But, back to the food: besides eating at Jazz Fest, which is wonderful, several meals were taken around New Orleans, both in the Quarter and outside of it, and we have a few new discoveries worth sharing. For us, oysters on our first day in NOLA are a must. On our last trip we tried Felix’s for the first time, and loved the casual vibe. 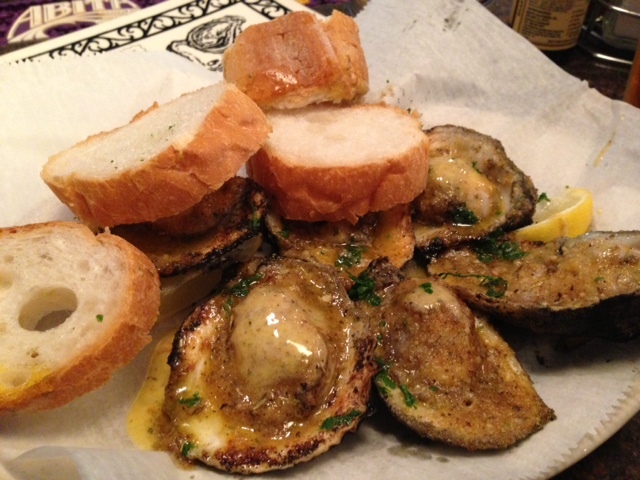 But last time, we had raw oysters; this time we tried the char-grilled oysters, and they were fantastic. Slightly smoky from the flames of the grill, and covered in garlic and herb butter and with french bread for getting all of the sauce, these were really addictive. We will definitely be getting these again. After the oysters at Felix, we walked around the quarter a bit (the sun was just starting to come out after several days of rain), and then decided to go to Stanley for a late lunch. We’d been to Stanley about a year ago, for breakfast, and loved it. This time, Rob got an oyster po-boy, and I got the chicken and alligator gumbo with a side of potato salad. The oysters on the po-boy had the same crisp, nicely dry coating as he remembered from his oysters benedict last year, but this time they sat on top of coleslaw in the traditional French bread, with a spicy remoulade sauce on them. Between the coleslaw and sauce, the oysters didn’t stay as crisp as they had been on the benedict dish, but it was a tasty sandwich overall. My gumbo was really delicious, and spicy but not overly so (I added some Crystal hot sauce). The potato salad was one of the better I’ve ever had, and surprisingly complemented the gumbo nicely. It was a good portion and just enough for lunch. After a short afternoon nap and a restorative shower, we were ready to hit the Marigny for some music and dinner. The bartender at Stanley had recommended Buffa’s, a small bar on Esplanade, for a particular piano player that would be there. We walked over, and found it to be so crowded it was impossible to get in (this was Jazz Fest weekend, after all). He was going to be playing for a while, though, so we headed over to Frenchman Street to find some food. 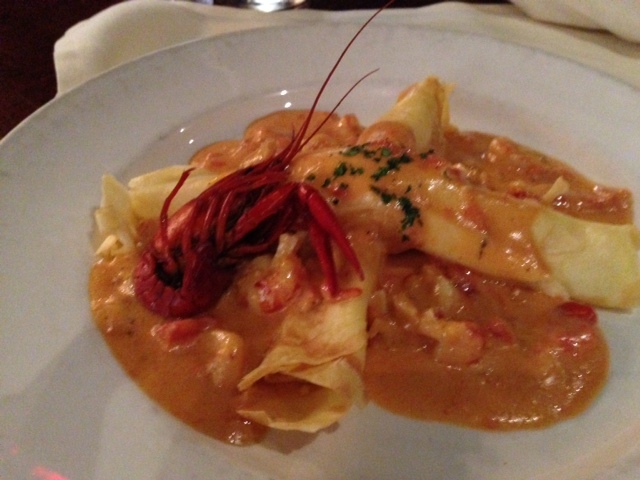 We ate at Marigny Brasserie last trip as well, and there was no line so we didn’t hesitate. This time Rob tried some gumbo, and I got a salad and a side of mac & cheese, which did not disappoint. This is seriously the best mac & cheese I’ve ever had. Rob’s chicken gumbo was very good as well. As with most places in New Orleans, especially during Jazz Fest, there was live music in the bar too – a duo that reminded us a bit of Annie and Sonny from “Treme”. We love Kermit Ruffins, and on Friday we read about a show he was doing that night at the Little Gem Saloon, a recently restored historic building in the CBD with two rooms for music as well as a dinner menu. Happily, we were able to get tickets so after the first (very cold & muddy) day at the Fest we showered and headed out to find the place, arriving early enough to eat downstairs before heading up to the 9PM show. We weren’t very hungry so we shared two appetizers. The shrimp, tasso & grits were delicious but SO rich and decadent we could not even finish the grits; the jumbo lump crabcake served over a julienne vegetable salad was also good. The cake was almost entirely crab (unlike so many crabcakes that are more breading than anything), and the vegetables were in a light lemony dressing that cut through the richness. The “rooster sauce” drizzled on top was VERY spicy and flavorful. We would definitely try this place again for more substantial food. Recently, there were rumours this historic, lovely restaurant and bar was going to be sold; thankfully, that has not happened yet and in talking with the bartender (the same one who’s been there literally every time we’ve visited), it seems like that might not happen. This is probably in large part to the outpouring of support by locals and tourists alike following the news. In any case, we knew we wanted to visit on this trip, and Saturday for an early lunch seemed ideal. We knew it would be a long day and a late night, given that Fleetwood Mac was the last act that day at the Fest, then we had tickets for Allen Toussaint at Snug Harbor at 9PM. We didn’t want to get to the fairgrounds too early, given that much of the day is on your feet. 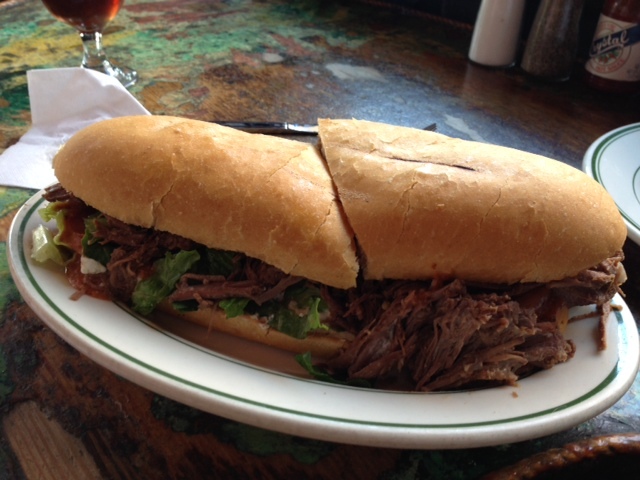 So, we slept in a bit and then headed to Tujague’s around 11AM, just in time for them to be serving lunch, and we had no hesitation: we shared the brisket po-boy and a caesar salad. Once you taste this sandwich, you’ll know why it’s famous. Dressed on crusty French bread with a mustardy horseradish sauce, it’s messy but worth every napkin. The caesar was really good, too, crisp, lightly dressed and with garlic croutons, it was an excellent complement to the sandwich. We were sure this was going to be a garfunkel; everything about it said so. The location on Decatur between t-shirt and voodoo souvenir shops, crawfish boil pot placed strategically in the window so you can see & smell it, it’s a common stop along Decatur for tourist walk-up drinks-to-go. Yes, this was a garfunkel waiting to happen, but we decided to chance it. You see, between leaving day 2 of Jazz Fest and getting to the 9PM Allen Toussaint show we had tix for at Snug Harbor, we had no time to eat (Snug Harbor doesn’t serve food upstairs at the show). So, we were desperate: it was 10:45 and our options for getting decent food were dwindling. Because despite being a late night party city, food options past 10PM are rather limited. We had tried our old favorite, Coop’s, but there was a huge line that wasn’t budging. Not wanting to keep walking just to find the same problem at other places, or resorting to a Lucky Dog from the cart on Bourbon, we timidly poked our head in here to see if they were still serving food, and they were. And we were quite surprised to find really pleasant, seriously good service, and the food was not only decent it was excellent. It was not just because we were hungry: my cheeseburger was gigantic, smothered in good cheddar cheese and sauteed onions (I declined the roast beef gravy that it could have come with as well), and super juicy. And did I mention gigantic? Rob and I could easily have split it. Thank goodness I did not order a side of fries. Rob’s oyster po-boy was, he maintains, the best one of the weekend. And, even better, they had a better-than-average wine by the glass list. We were floored, because this is a place we’ve passed dozens of times without giving it a second thought. Lesson: never judge a book by its cover! Sunday in New Orleans means brunch, of course, and one of our favorites is Muriel’s. Right on Jackson Square, this is a lovely restaurant with live jazz in the delightful, sunlight courtyard bar. We didn’t have a reservation, opting instead to take our chances in the bar, and our patience was rewarded after about five minutes as we nabbed two seats right after ordering our bloody marys (which are really good, and only $6). 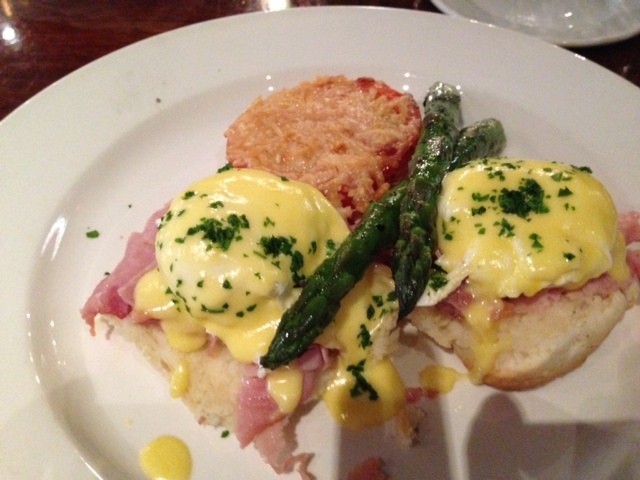 I ordered what I have each time we’ve come, simply because it’s really a perfect eggs Benedict: thinly shaved ham on top of biscuits, topped with perfectly poached eggs, creamy hollandaise, and with grilled asparagus and a parmesan crusted roasted tomato. Rob actually had one of the appetizers, the crawfish and goat cheese crepes, which were creamy, rich and delicious, and very filling. They happily bring you bread and butter to start, too. While not inexpensive, it’s still reasonable for the great food and pleasant atmosphere. After our meal at Marigny Brasserie, we went back to Buffa’s to catch the end of that piano player’s set. It had thinned out by then, so we were able to grab seats at the bar. And as we sat there, we saw plate after plate of great looking food coming out of the kitchen. So, after our final day at Jazz Fest, and a backyard crawfish boil up in Gentilly, we decided to walk back and check out what was happening at Buffa’s. We happened upon a great show, Ricardo Crespo, and by then we were hungry again so we ordered some food. My chorizo bean chili was super spicy (I added cheese & fresh jalapenos) and delicious, and Rob was thrilled with his grilled redfish po-boy topped with a Sambal sauce. We also discovered this place is open, and serves food, 24 hours a day, and music most nights. Yes, we will be coming back here. We can’t even count how many times we’ve been here now, and on the last few visits this has become our traditional “closing” lunch. We almost always order the same things: jambalaya for Rob, smoked duck quesadilla for me. But this time we both decided to try something new, and unsurprisingly Coop’s did not disappoint. 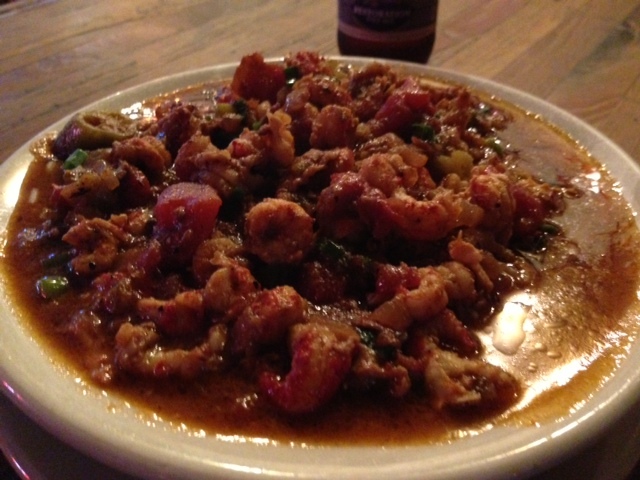 Rob’s crawfish etouffee was spicy, rich and incredibly satisfying. 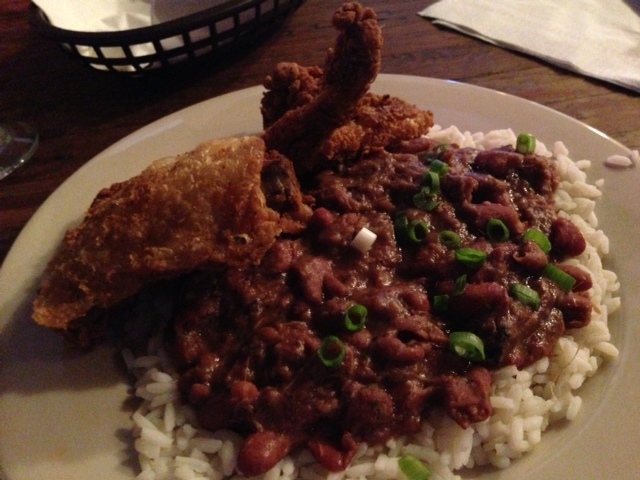 Being Monday, I went with the traditional red beans & rice, and added 2 pieces of Cajun fried chicken. OMG. I had heard Coop’s had great fried chicken, but I had no idea. I actually don’t even like fried food, but I WILL be getting this again. It was amazing. The red beans & rice were great, too, with a rich, meaty gravy; it was not spicy at all but some Crystal hot sauce took care of that. All in all, a fantastic weekend for food & music, and as always we were sad to leave. But, with some great new discoveries from this visit, we’ll be well prepared for the next time…because there’s always a next time.